Everyone attending must have a ticket. So get your tickets early as previous dinners have sold out fast. All Preschool children are free; $10 for 5-8 year old. Registrations can be made online at: www.cam.org.au/lifemarriagefamily or alternatively by contacting: 9287 5587 or lmf@cam.org.au. Please note that registration closes on Friday 24 May. 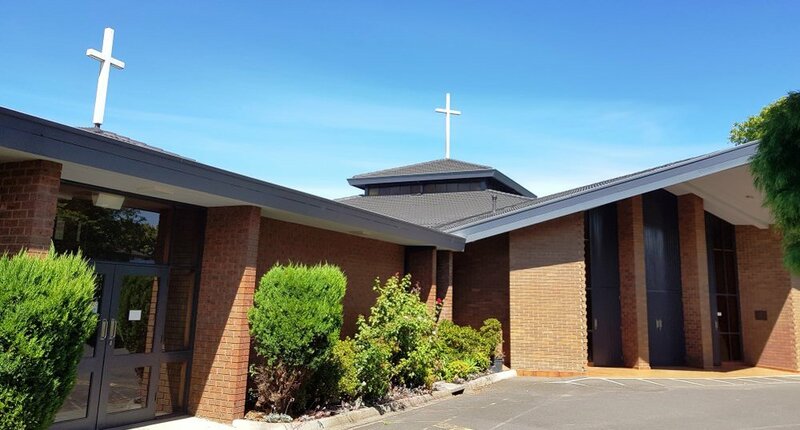 During the first half of the twentieth century, St. John the Baptist's Church Ferntree Gully served the greater Catholic community throughout the hills district, including Bayswater. Later, Mass was celebrated in either private homes or in the Bayswater Community Hall according to the availability of priests from Ferntree Gully or Croydon monastery. By late 1946 or early 1947, the community acquired an old, wooden, seamen’s mission hut which they transported to land donated by the Read family on Mountain Highway. In 1949, Our Lady of Lourdes Church was built on this site (where Woolworth stands today); and it was officially opened and blessed by Archbishop Mannix on the 8th of January 1950. Later much of the land on Mountain Highway was sold to establish a Primary School in Boronia, and what remained was a small tract of land occupied by the little church. As the population increased in Bayswater, a Primary School became a felt need and the present land at Orange Grove was bought. By February 1965 a church-school was officially opened and blessed by Archbishop Simmonds on the 11th of July, 1965 dedicated to Our Lady of Lourdes. It was still under Boronia parish. In 1967 there was a significant push from the community itself to have its own separate identity – to become the Parish of Bayswater, instead of being part of the Boronia Parish. A small determined delegation of men from Our Lady of Lourdes was sent to Archbishop Knox to accomplish it. As a result, in November 1967, the Archbishop gave his approval to form a separate parish at Bayswater and on January 20th 1968 the Parish of Our Lady of Lourdes Bayswater was officially established. We enjoy the fruit of the hard work of many. Some of them have gone to their eternal reward and some of them are still with us. Let us gratefully remember and pray for all those who have shed their sweat and blood and spent their treasure for this parish. May God bless them all. As we celebrate the glorious moment of our Parish, our new altar which is dedicated today will stand as a memorial of our Golden Jubilee.